Oil prices are down across the board this morning, driven by bearish data coming from the International Energy Agency (IEA) this morning. After shedding a quarter on Monday, WTI crude prices are down again by 29 cents, trading at $56.47. Prices have been trending in the $56-57 range for the past week, a step up from the $55-56 range the week prior. Diesel prices fell 1.2 cents yesterday, influenced by a declining crude market. Diesel crack spreads remain elevated, still in the $24-25 range per barrel of diesel. The last time crude prices were at these high levels (summer 2015), diesel crack spreads averaged around $18-20/bbl, yielding lower prices overall. Given the summer drawdown of diesel stocks and strong expected winter demand, though, diesel prices remain elevated, and some say they could surpass $2/gal by year end. Diesel prices are currently down 1.38 cents (0.7%) to trade at $1.9183. Gasoline prices saw light losses yesterday, shedding .6 cents during the trading session. 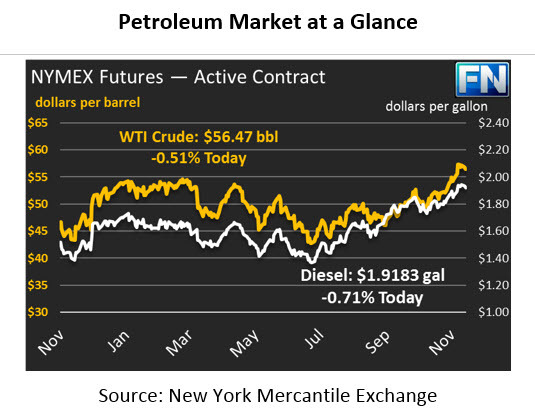 Today, gasoline prices are continuing their losses, outpacing crude and diesel declines. Gasoline prices are down 2 cents (1.1%) to trade at $1.7729. The IEA published their monthly Oil Market Report as well as their annual World Energy Outlook 2017, which are pushing the market slightly lower this morning. Unlike OPEC, which pointed to higher demand and lower supply, the IEA’s report shows lower demand in 2017 and 2018 mixed with rising supply from the U.S. The organization does note that OPEC supply declined in October, with deal compliance at 96% (above its YTD average compliance of 86%). Overall, the expectations for Q4 2017 and Q1 2018 are for oversupply of crude to prop up inventories. 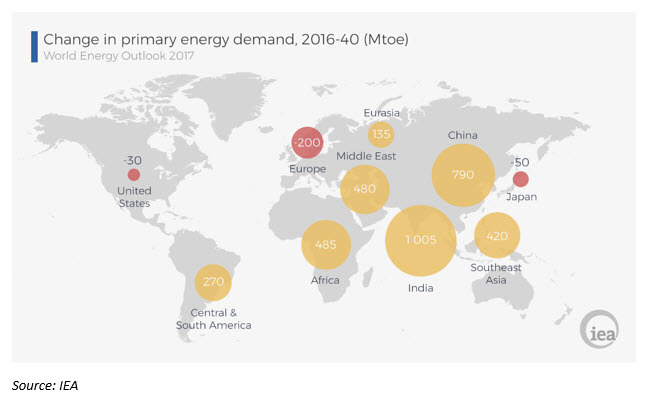 The main takeaway from the World Energy Outlook 2017 was that the U.S. and China will define the supply and demand pictures, respectively, through 2040. Based on current growth trends, by 2030 the U.S. will be producing 50% more oil and gas than any other country in history, surpassing 30 million barrels of oil equivalents per day. The U.S.’s influence over oil markets, mixed with improved energy efficiency technology driven by China, will keep oil affordable and a growing part of the energy mix through 2040, despite alternative energy sources growing their market share.